Heal your Gut features over fifty sweet and savoury recipes designed to restore inner gut health. 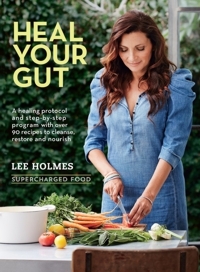 Join Lee as she discusses her techniques for balancing gut bacteria with food to achieve optimum and enduring health. Bring your questions for a chance to get expert recommendations. Entry by gold coin donation, bookings essential, phone8372 5100 or book online. Light refreshments provided. Books available for sale on the night.